Helping Pet Adoption < Regular Walks Help Shelter Dogs Become More Adoptable! It’s one thing to know it, but another to prove it! A recent study focused on shelter dogs in Vienna, Austria. Their goal? To find out what would increase the chances for long-term shelter dogs to get adopted. It turns out they were able to conclude and actually prove that socialization and basic training were found to significantly improve the chance for adoption however time constraints often does not allow most shelter staff to engage in additional activities Person walking dog on leash with the animals. Yet the Vienna Shelter knew they could come up with a way to help their animals! They created a ”sponsors of care” program designed for each shelter dog to be matched with a sponsor who would be responsible for taking the dog on regular walks. The shelter even created a training program for sponsors to attend, and offered supervision when difficulties arose. Over the years since this program began in 2003, the number of sponsors working with dogs has increased, many sponsors ended up adopting their shelter dog, and best of all as a result of this program, the number of long-term stays was reduced from 26% to 12% by 2009! This study proves that taking shelter dogs for walks significantly increases their quality of life as well as their chances for adoption. 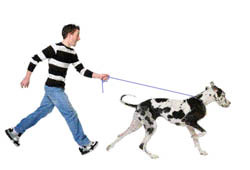 Dog walking has health benefits for the humans too! If you’re a volunteer at a shelter or rescue that doesn’t yet have a dog walking program, feel free to share this article with them and let them know you’re interested in dog walking! Passionate tennis-shoe -wearing folks are needed who are willing to hoof it and woof it can help shelter dogs become more adoptable!